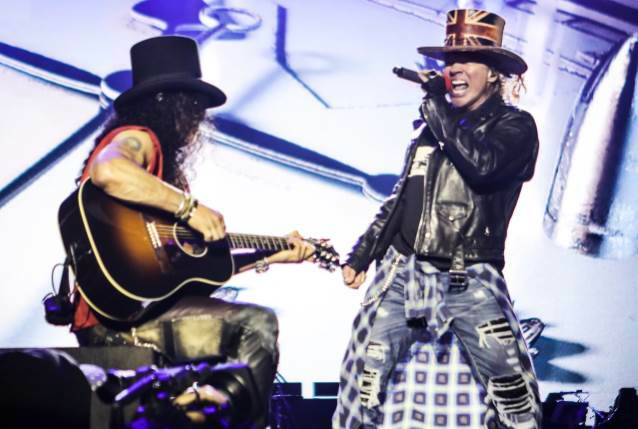 GUNS N' ROSES has shared a behind-the-scenes look at the latest European leg of the band's "Not In This Lifetime" tour. The video, which can be seen below, shows at breakneck speed how Axl Rose, Slash, Duff McKagan and the rest of the GN'R crew prepare before hitting the stage at performances, including Download festival in the U.K. GUNS N' ROSES is currently on the road playing 27 dates through the end of the year, and will close 2018 in Johannesburg, South Africa on November 29. According to Billboard, "Not In This Lifetime" ranks as the fourth-highest grossing tour of all time, based on Billboard's Boxscore archives. The trek, which launched in April 2016, topped the $475 million mark in gross sales with the final show of the band's 2017 touring schedule on November 29 in Los Angeles. About 70 people travel with the "Not In This Lifetime" show in addition to the truck drivers; that number goes upwards of five hundred, including the local workers, by show date once catering, security, etc. are factored in, according to the GN'R tour's production manager, Dale "Opie" Skjerseth. The "Not In This Lifetime" tour features classic lineup members Slash (guitar), Duff McKagan (bass) and Axl Rose (vocals) backed by guitarist Richard Fortus, drummer Frank Ferrer, keyboardist Dizzy Reed and new second keyboardist Melissa Reese.